I love baking. Pies, breads, tarts, cakes-you name it, I'll bake it. Well, everything except cookies. I know this will probably sound silly, but I have never had the patience to bake cookies. I won't even bother with that pre-packaged cookie dough that you just break into squares and plop onto a cookie sheet. My mother, on the other hand, was the chief cookie baker in our family. Every Christmas, she'd make dozens of cookies for family and friends. One particular cookie was a huge hit with our family and was requested every holiday season. 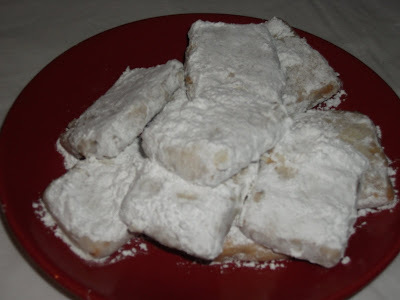 My mother affectionately called them Pecan Dusties: buttery pecan shortbread rolled in confectioners' sugar. It has been three years since I've tasted my mom's beloved pecan dusties, two years since I lost her one week after Thanksgiving in 2007. This holiday season, I decided that I would carry on my mom's tradition and prepare batches of her pecan dusties to share with the family. I'm so glad that I asked her how to make these before she passed, and I am happy to share the recipe here. Warning: these cookies are very addictive (seriously). Be prepared to make a few batches because these cookies will be gobbled up in no time. In a separate bowl, sift flour and salt. Set aside. In a large bowl (using an electric or hand mixer), cream butter until smooth. Add sugar and beat for about two minutes until smooth. Beat in vanilla extract. Gradually stir in flour until incorporated. Stir in pecan pieces. Flatten shortbread dough into a disk, wrap with plastic wrap and refrigerate for at least one hour. Preheat oven to 400° . Line cookie sheet with parchment paper. On a lightly floured surface, roll shortbread dough to ¼ inch thickness. 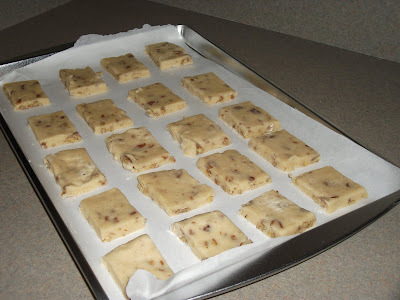 Using a knife, cut dough into little rectangles (about an inch wide). Place the cookies onto the cookie sheet and place in the refridgerator for about 15 minutes. 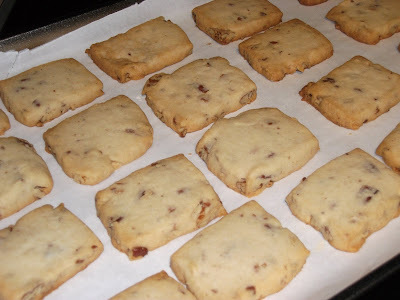 Bake shortbread cookies for about 15 minutes, or until cookies are lightly browned. You don't want the shortbread to get too brown so keep a close watch on them. Allow cookies to cool on rack for about 5-10 minutes. While cookies are still a little warm, gently roll them in confectioners' sugar. Now, we're going to give these cookies a "double dip". Set the cookies aside for about 3 minutes, then roll the cookies for a second time in the confectioners sugar. If need be, these cookies can be stored in an airtight container for up to a week. Enjoy! Dang. Will have to try those! 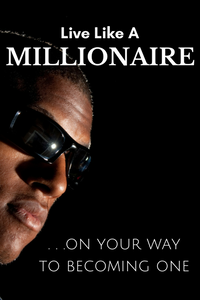 Give 'em a try...I really think you'll enjoy them! They're easy to whip up too.